Rocket Lab has successfully launched 24 satellites in the past year, but what do they do and how might they benefit New Zealand? 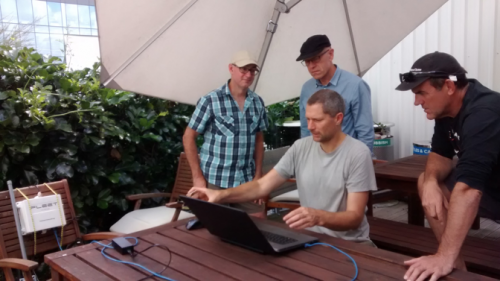 The IoT Auckland Meetup group got an opportunity to find out about the potential of some of this technology during a two-day hackathon held at the University of Auckland. IoT Auckland founder John McDermott says during the hackathon the group used satellite technology supplied by two companies - Fleet Space and Myriota - whose satellites were launched in November by Rocket Lab for Fleet Space and Elon Musk's SpaceX for Myriota. "IoT Auckland was created to assist local developers and entrepreneurs in making the most of new opportunities so it is very pleasing to be on the leading edge of using IoT satellite technology," McDermott says. "An example we explored during the hackathon was sending short messages from a mobile phone via a satellite connection. This could potentially be used by tourists in New Zealand to send updates as they travel remote walking trails." McDermott says that IoT satellite systems provide low-cost data connectivity for remote monitoring systems where telco connections are not feasible or economic. As an aside, $5 per device per month for regular connections is often quoted, although this cost is expected to fall as the technology matures. While IoT satellites won't provide phone call capability they can be used for environmental monitoring such as water quality, agriculture weather monitoring for frost alerts, utility monitoring of remote water and electric infrastructure, tracking, and monitoring of things such as boats, beehives, and camper vans. McDermott says that IoT satellite technology is rapidly growing as companies such as Rocket Lab undertake more commercial launches. It is expected over 1000 of these satellites will be in orbit in the coming years. "With global challenges occurring in agricultural productivity, environmental protection and the effects of climate change, New Zealand has the opportunity to be a world leader in using new technology such as satellite IoT services." Fleet Space and Myriota are start-up companies based in South Australia, which McDermott describes as a location that is "fast becoming a world leading centre for space related technologies." Both companies have been keen to engage with IoT Auckland, with Fleet Space CEO Flavia Tata Nardini presenting to the group in November following the Rocket Lab launch. Tata Nardini stated, "Fleet Space is very happy to support the IoT Auckland group in understanding how to use our satellite technology. It's great to have such skilled developers wanting to be among the first to use Fleet Space and show what we can do." Myriota Business Development Executive Tom Raynor describes New Zealand as a key market. "We see applications in agriculture, asset tracking, weather and water quality reporting and primary industries. It's great to have a Kiwi team with interests in these areas demonstrating how to create software with us." IoT Auckland, which has 2000 members, was founded by McDermott in 2016 to provide a forum for IoT developers, start-ups and those interested in the technology.